> Optical RCA Audio Adaptor For XBOX 360 Cable. > Compatible With Xbox 360 / Xbox 360 Slim. > Output: RCA Red / White (L / R) channel;. > Dolby Digital 5.1 Surround sound output. > Dolby Digital 5.1 Surround sound output. OFFICIAL Turtle Beach XBOX 360 AUDIO OPTICAL RCA ADAPTER CABLE. This will allow you to use a headset/headphones for audio (3.5mm jack) for an Xbox 360 whilst you use a HDMI cable. This is great if you tv doesn’t have an audio out (3.5mm jack) or just not good quality. Compatible With Xbox 360 / Xbox 360 Slim. Output: RCA Red / White (L / R) channel; Toslink Optical Audio. Dolby Digital 5.1 Surround sound output. We are always happy to resolve any problems of yours. Compatible With Xbox 360 / Xbox 360 Slim. Output: RCA Red / White (L / R) channel; Toslink Optical Audio. Audio Accessories. Dolby Digital 5.1 Surround sound output. SmartPhone Accessories. Tablet Accessories. OFFICIAL XBOX 360 (turtle Beach ) AUDIO OPTICAL RCA ADAPTER CABLE. 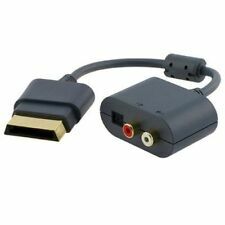 RCA audio cable adapter with 3.5mm stereo female to dual 2 rca male cord used for Microsoft Xbox 360. - Built-in optical RCA audio adapter for non-HDMI supported stereo systems. - Output: RCA Red / White (L / R) channel, Toslink Optical Audio. OFFICIAL MICROSOFT XBOX 360 AUDIO OPTICAL RCA ADAPTER CABLE. Condition is Used. Dispatched with Royal Mail 2nd Class Large Letter. This adapter is used, but is in good condition and has been tested and is in perfect working order. Item has been tested and is in good condition and working order. OFFICIAL MICROSOFT XBOX 360 AUDIO OPTICAL RCA ADAPTER CABLE This is for audio equipment like turtle beach headsets it does not provide a picture for the tv. Genuine official Microsoft Xbox 360 audio adapter for the older style Xbox 360s. 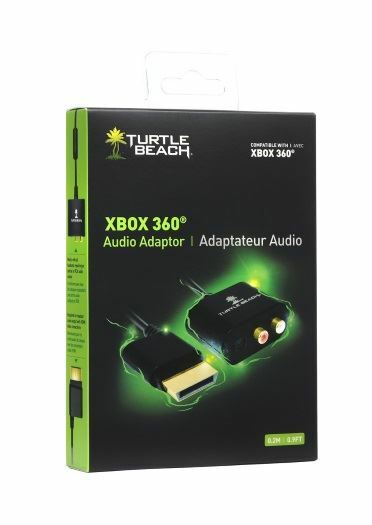 The Turtle Beach Ear Force Xbox 360 Audio Adapter provides RCA (stereo) audio outputs when using Xbox 360 models with an HDMI connection. 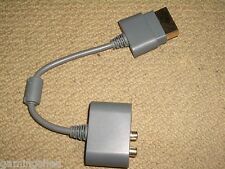 Not compatible with Xbox 360 E.
Authentic Microsoft audio optical rca adapter cable. THIS ITEM HAS BEEN USED BUT IS IN GOOD CONDITION. Suitable for fat model of Xbox 360 only. Genuine Turtle Beach Audio Adapter. box has been opened but item is unused. Installing a tape cassette deck. Installing a record turntable. Technical Support. COLLECT IN PERSON Yes sure as long as we haven't already 'dispatched' the item. Only if stated or shown in the picture, as for manuals, most information can be found on the usual web based search engines. This will work with all XBox AV leads. Xbox 360 Optical RCA Audio Video Adapter with 2m HDMI HD AV Cable Lead Grey New. Utilize the Optical/RCA Audio adapter for enhanced sound in non-HDMI supported stereo systems. 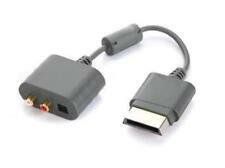 HDMI HD AV Cable Optical Audio Adapter for Xbox 360. Official Xbox 360 High Speed Gold HDMI Cable by Microsoft. New just been taken out of the bag for photos. 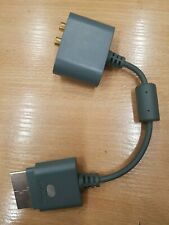 MICROSOFT XBOX 360 HDMI AUDIO ADAPTER. For Microsoft Xbox 360. 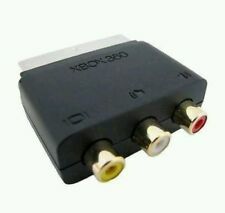 Useful for the XBOX 360 that requires the XBOX connector, to provide either a Twin Phono / RCA or Optical TOS Link output. This is useful for use with sound bars or gaming chairs. Supported Digital Audio Type: PCM. Connector: Microsoft Xbox 360 AV Plug to Component Y/Pr/Pb, L-channel, R-channel (Male), Composite video. Xbox 360 TV Lead. X-Box 360 Connector to 6 Phono Component HD AV Cable with Optical Output. Official Microsoft Xbox 360 Audio Adapter. Condition is Used. Dispatched with Royal Mail 2nd Class. HDMI Cable: 2m, Adapter: 20cm (approx). RCA Audio adapter for non-HDMI supported stereo systems. Colour: Grey. High-definition video and high quality audio in one cable. USB Power Adapter. High quality cable. Contents: 1 x Audio Cable Adapter Brand Unbranded MPN Does not apply EAN 191466095249 UPC 191466095249. XBOX 360 VGA AV CABLE. For Microsoft XBox 360. Features stereo audio out cables and an optical port. Adaptor only, in Good condition. RCA adapter. Fully working, tried and tested. 1 x L/R Optical Audio Adapter for Xbox 360. - Output: RCA Red / White (L / R) channel; Toslink Optical Audio. - RCA Audio adapter for non-HDMI supported stereo systems. - Dolby Digital 5.1 Surround sound output. OFFICIAL MICROSOFT XBOX 360 AUDIO ADAPTER. Condition is Used. Dispatched with Royal Mail 1st Class. Output: RCA Red / White (L / R) channel; Toslink Optical Audio. Compatible With Xbox 360 / Xbox 360 Slim. This is for an unboxed Official Xbox 360 Audio Adapter. Colour: Grey The item is a Genuine Microsoft Product and not a dangerous overseas import. It is in Very Good used condition and has been checked and cleaned before listing. We take down the serial number, a picture of the unit and your details upon purchase and if the item breaks within 3 months we will replace it for you! NOTE: NOT BOXED JUST THE CABLE IS INCLUDED.